These induction welded thermoplastic composite primary structures are said to be the first of their kind in the aerospace industry. 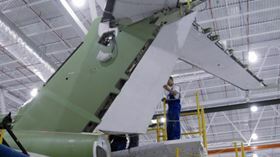 Fokker Aerostructures designed and developed the Gulfstream G650 tail section and industrialised the new induction welding method for the rudder and the elevator. The thermoplastic material is Fortron® polyphenylene sulphide (PPS), a high performance engineering polymer, from Ticona. TenCate Aerospace Composites produces the carbon fibre/PPS semipreg and plate material used. With the welding technology developed by KVE Composites Group, components are joined into one unit by induction welding, eliminating costly drilling and riveting work. KVE's assembly technology for carbon reinforced thermoplastics, called KVE Induct welding technology, generates eddy currents in the electrically conductive carbon fibre of the thermoplastic laminate by moving a coil over the weld line. These heat up the laminate from the inside, the thermoplastic matrix melts and the two parts are welded together. The two parts are positioned in special tooling material, which is both ‘transparent’ to the electromagnetic (EM) field and has a reasonable thermal conductivity. 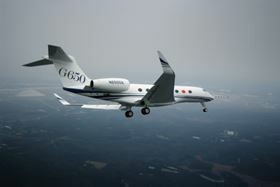 The Gulfstream G650 eight-passenger business jet made its first flight in November 2009. Netherlands companies Fokker Aerostructures, KVE Composites Group and TenCate Aerospace Composites, Gulfstream Aerospace Corporation of the USA, and Ticona GmbH, Germany, won a JEC Innovation Award in the Aeronautics category for the welded thermoplastic composite rudder and elevator. The award was presented during the JEC Composites Show in Paris in April.